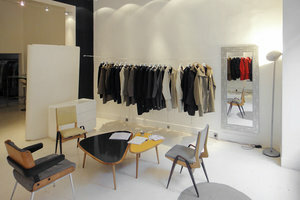 This amazing boutique and showroom is located in Palais Royal, an upmarket and prestigious area of Paris. It is ideal for Fashion Showrooms, Pop-Up Stores, Product Launches and Fashion Week Events. 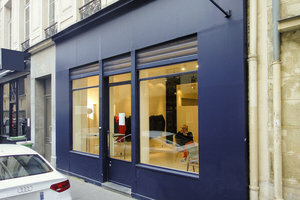 The space is finished to an excellent standard and is characterized by a lovely navy frontage with display windows. Inside, the interiors are minimal and modern with white walls, stone floors, spotlights and an eclectic selection of furniture that give the space a trendy feel. The charming boutique is divided over two rooms. The second area can be used for storage making this space ideal for ready-to-wear sales or product launches. 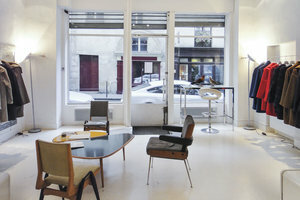 Situated in a prime location close to Rue Saint-Honoré, Rue des Pyramides and the luxurious Avenue de l'Opéra, this space is an outstanding opportunity for brands and designers looking to align with high-end retailers.